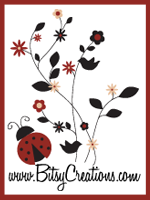 Vintage Body Spa, LLC has an awesome variety of bath, body, and spa products to offer new and established customers. The company's slogan, "Indulge your body", is definitely a great choice. 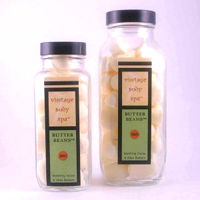 For a luxurious spa experience at home, you have to treat youself to some goodies from Vintage Body Spa, LLC. The designs are neat yet stylish...with just the right amount of "WOW"! The totes and bags in the company's original paisley design are wonderful, but they have started to offer something new for 2007...The leather Molly Tote! The design is clean and the tote is functional. My favorite color is the Gold Leather. Yes, I can surely see myself wearing a fierce outfit, with pumps to die for, and this tote clutched between my fingers. I'm making my birthday wish list soon and you better believe that the Gold Molly Tote will be on it...close to the top of the list! You can check out other Tucker Paisley bags, totes, and accessories at www.tuckerpaisley.com. 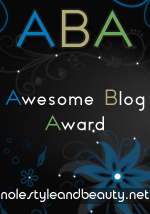 To see a list of the members, please click here. Tilted (the name of the necklace by designer Mandy Wu) is a very unique piece. I can think of a few different outfits this would flow well with. 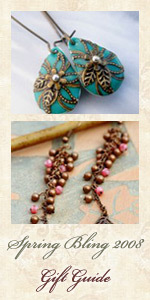 The bronze ribbon is adorned with a vintage turquoise button...adding just enough color. Mandy Wu's designs are very different - offering an array of unique creations. E.V.O.D is the online shop where you'll find something for that girl with a style all her own. 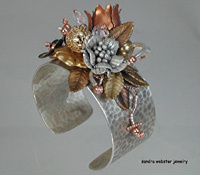 There's not a piece of jewelry in Sandra Webster's jewelry collection that I do not like. All of her designs are beautiful to me, but my favorite of all pieces would have to be the "Copper Tulip" cuff. This is one piece of jewelry that can simply be worn alone. This hammered sterling cuff is adorned with vintage flowers and leaves, among other interesting pieces. The cuff is smooth on the inside and fits almost everyone. 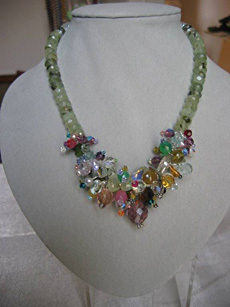 To view this piece and others in Sandra's collection, click here. All this week, we are going to be featuring our favorite products from our members at NoleStyleandBeauty.com. First up is the "Deluxe Cluster Gem" Necklace ($169.00 cdn) from Monforte Jewelry. 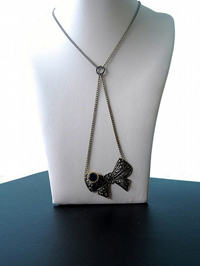 This necklace is a mixture of old world charm and new flavor. It's the perfect piece for those times when you want to present your classy, stylish self.